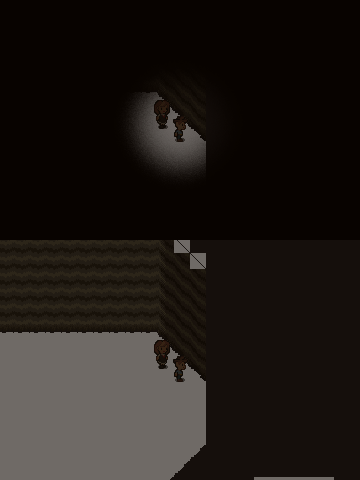 The next real update worth posting will be towards overhauling my flawed "reels" mechanic. Where a battle would start with 3 random modifiers. As you can see, the lack of negative impact to the game makes these optional. This was due to the reception over an idea of forced, negative challenges enforced upon you. And honestly, this system is more what I intended anyways. 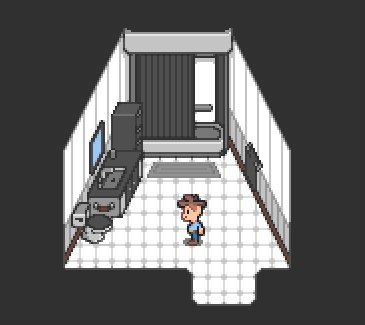 Experimenting with some smaller rooms such as bathrooms. Because video games never have these things. I'll never understand why, either. I mean, if people are afraid it's because of sanitary reasons, then design a clean bathroom. I mean, if all these video games nowadays can render thousands of polygons with realistic textures, then how can you say your game is realistic if there's no room to wash your hands? I thought this would have been a funny detail to add for those who always keep doing the same action on a single thing, and expect something to change. There's probably some grammatical errors in the text, because I didn't proofread it yet. I love finding little things like this in games, as well as hidden achievements and easter eggs. By the way, it's all looking great. Good job! Didn't expect the videos to count as a flash element. And this room is now finished! Just a minor nitpick - it might be what you intended - but is it just me, or does the floor look a bit flat in that room? The mat really amplifies it as well. Anyways, I've been meaning to say that this project is really cool. You're doing a really good job on it. 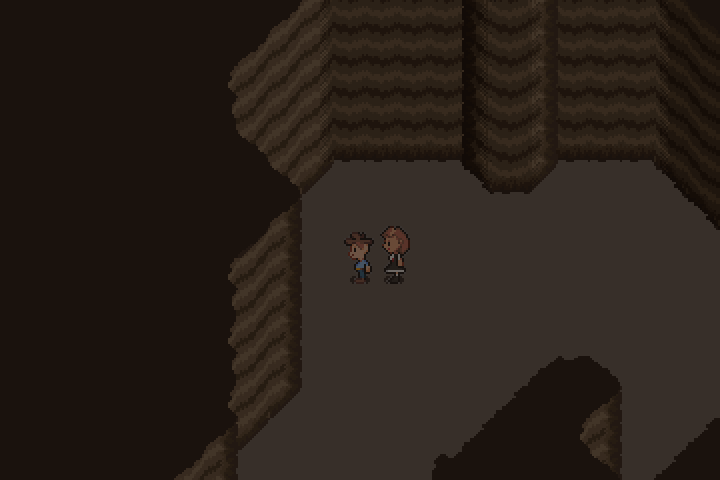 The floor was just me being quite lazy with designing the graphics, as I sorta just made the tiles a layer behind the map, and just looped tiles. I'll fix it sooner or later. 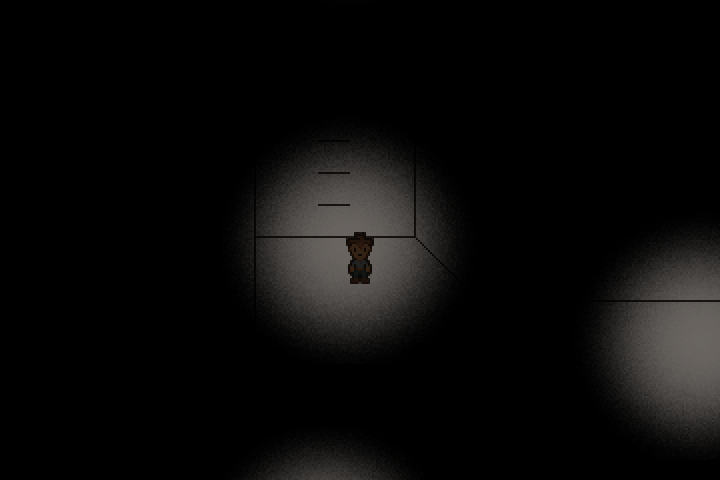 Also, been testing the fake-light source things I planned out for the cave maps awhile back. Personally, I think it didn't go well, may just scrap it for something more logical, like a light source defined on the player. Turned it from a static lightsource to a dynamic one that follows you around. This is the same scene with the lights on, and off. As you can tell, it's pretty WIP. Have in mind where the light source is located. Behind or infront the character and try to visualize it that way. It makes a huge difference. Right now your characters look very dark. 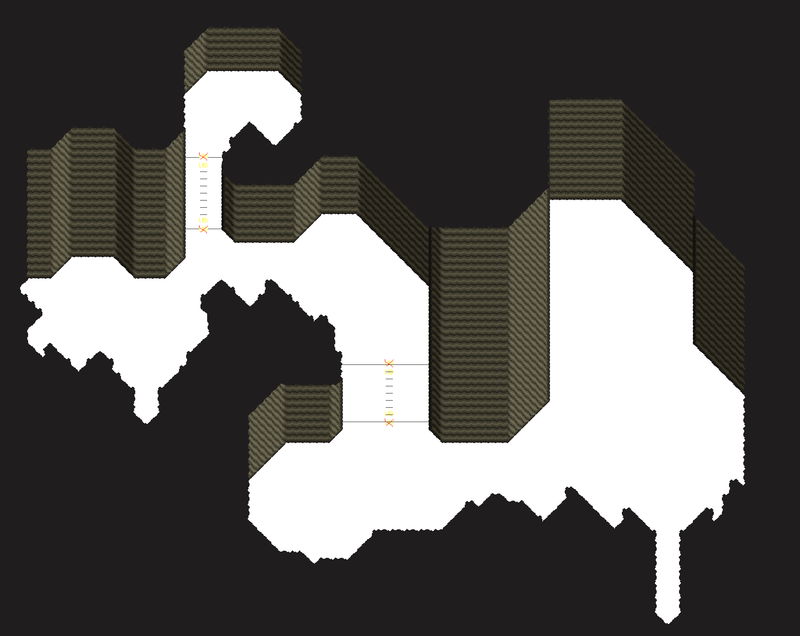 WIP of the cave map. The tileset may not be final. Been making the caves feel less open, and more "tunnel" like by making the base area use less basic, geometric line based designs for the walls. Another update on the caves. For those who are wondering, this area has actually already been written into the game, actually. It's a waterfall filled cave. 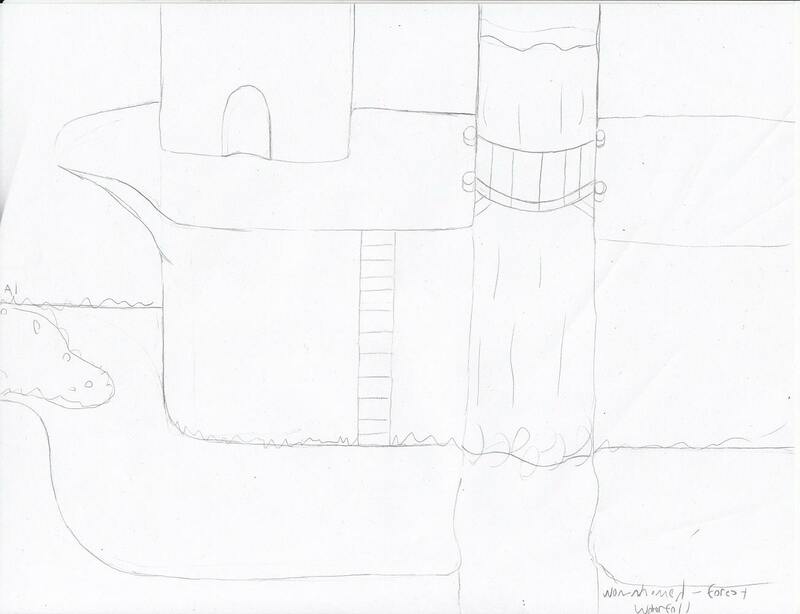 While I never got to drawing water, this map below is where the water would flow outside. 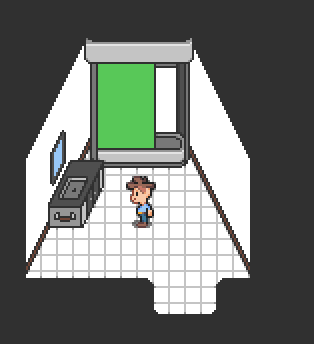 The map for the entry area still hasn't been mapped out, yet. Though, the concept does exist. This area's main purpose is to serve as an alternate way to get yourself to the other side if the bridge ever goes out. 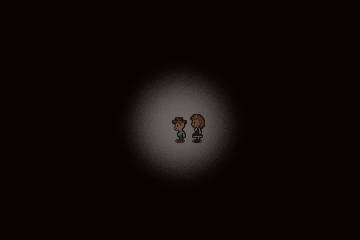 It's pretty dark, as you'd expect. And usually, entry is forbidden due to the fact most who come in never return out. 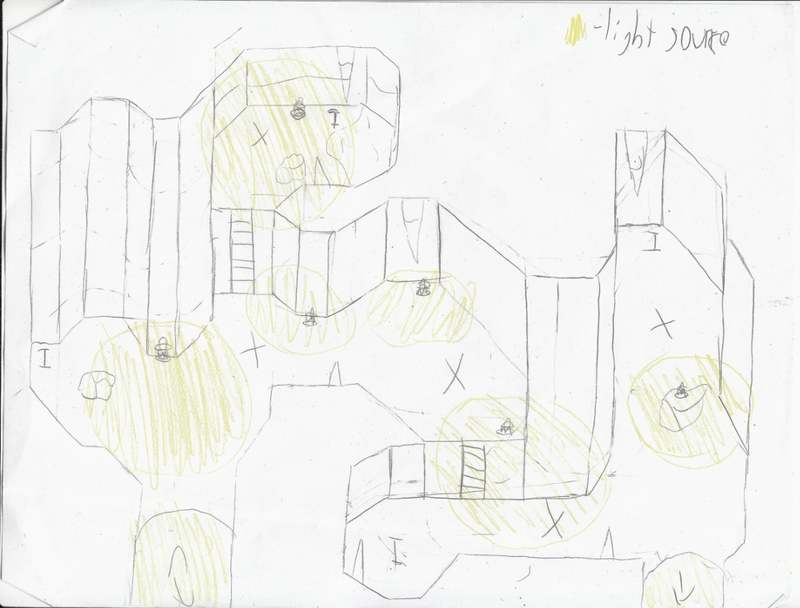 Here's some more screencaps now the map is starting to be finalized. Well, with a lack of water, that is.